Register Log In Moparts Forums Moparts Question and Answer `61 Fury and `62 300 axle the same ? I have a damaged axle in my `61 Fury and found a `61 300 complete axle and housing that I would like to know if all or at least axle the same length. Didn't find info in tech section due to the early year. Could be the same. You need to check if either rearend is a sure grip. They are different length axle shafts on sure grip and open axles in the same car. Difference is the center pin width in the differnetial. Difference in length is 1/8" per axle shaft. You can shorten and axle shaft on a lathe. If both are open axles, they will swap. If both are sure grip axles, they will swap. 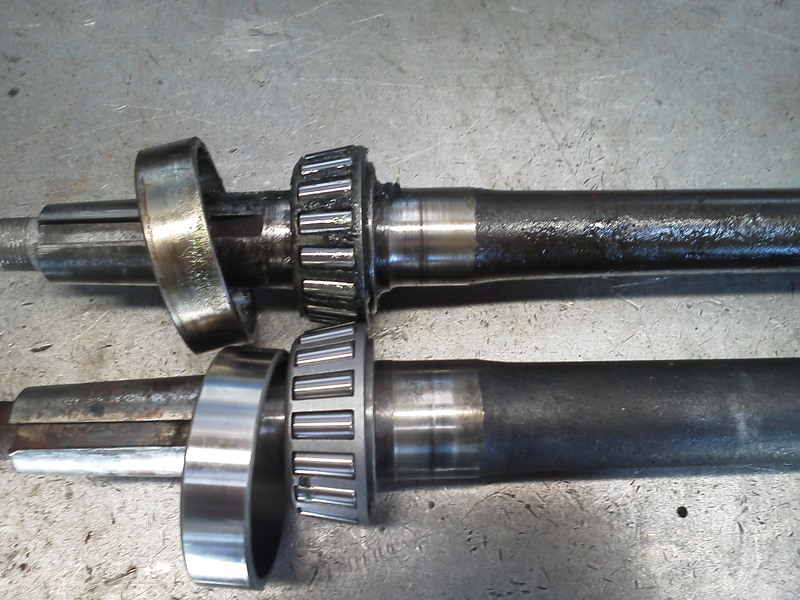 '57-'64 axle shafts are all the same with the SG/non-SG provision. The bolt pattern at the end of the main housing changed in '62 so the complete rear ends aren't totally interchangeable (pre-'62 has no parking brake provisions). 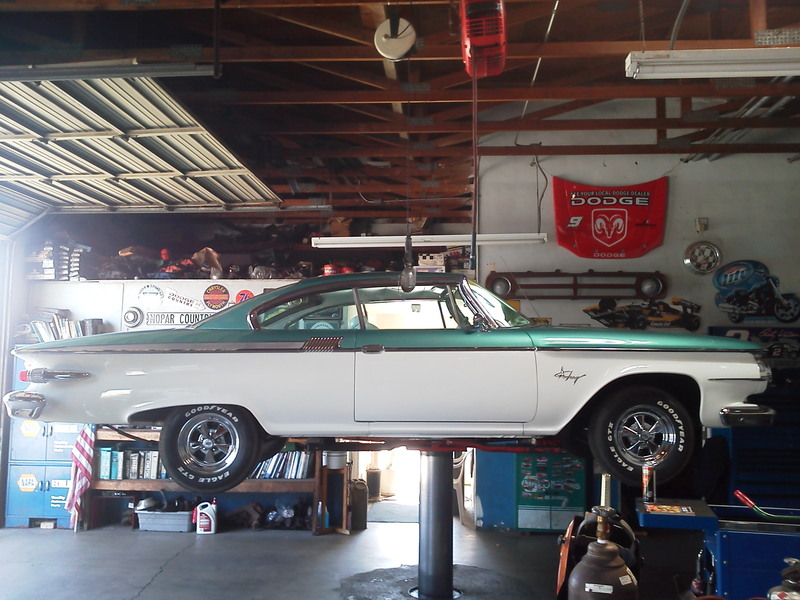 I bought an axle for the `61 Fury I am working on and made sure to get a NON Sure-Grip axle. So pulled mine out and compared to the replacement and believe they still sent me a SG axle because it is larger. It looks to be same length and bearing surface is same size, only seal surface is larger. I looked in book and bearing is same # just seal is different, so I ordered that to see if this will work. I should know for sure if it will work when I set end play. You realize the difference between SG and non-SG is the length. Looks to me there is more than just the bearing seal diameter difference. Looks to me the lower shaft pictured is beefier all around. Which tells me it's probably a beefier axle for the 300 setup. So is it a 61 300 or a 62 300 donor, cause you list both. The seals are different 61 vs 62 300. Last edited by Supercuda; 09/21/15 02:02 PM. Yes the whole axle is beefier for sure you are correct. Laying side by side and looking real close I do not see a length difference, but not saying for sure. I was expecting a length difference and still trying to find out where it is longer. I got a 471862 SG seal which has the correct dimensions. Between the bearing and the splined end is where the length difference would be. My buddy has been building this `70 Cuda protouring style for years now and I always ask " Hows Supercuda coming along? " The SG axle shaft is only 1/8" shorter than the non-SG axle shaft so measure carefully. Run the tape measure parallel to the centerline of the axle, not down the side of the axle shaft. Just to be sure I took it to the machine shop and this one is same as old one in length, so I put in and set end play. Had to remove a shim then it was right on. Drove it around and rechecked , all is good. Got lucky on this one.